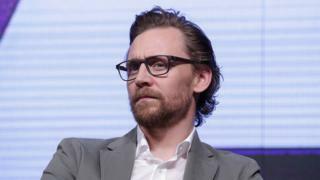 Creepy, uncomfortable and downright weird are just some things an advertisement starring Tom Hiddleston has been called, but none of that will matter as it's found success with its intended audience - Chinese women, as the BBC's Yvette Tan explains. Imagine waking up in the morning, walking down to your stylish kitchen and finding actor Tom Hiddleston making breakfast for you. It's a fantasy vitamin company Centrum is cashing in on for its new Chinese advertisement. It may have been widely mocked in the Western media, but the made-for-mobile ad has been remarkably well-received in China. The minute-long video filmed in vertical format was posted from Hiddleston's official Weibo account on Wednesday. It's filmed from the perspective of Hiddleston's partner sitting at the table while he, decked in an apron, makes a healthy breakfast for her. He then says in Chinese 还有你的善存, which can be translated as "here's your Centrum", or "don't forget your Centrum". The Avengers' star has more than 600,000 followers on the popular Chinese social media platform, which is not a huge amount given some Chinese stars have Weibo fan counts in the millions. But the video went viral anyway and had been watched more than 2.5 million times by Friday. The Chinese word for #Centrum soon began trending - with over 32 million users interacting with the hashtag. Many expressed their glee at finding themselves the object of Hiddleston's affections, with one fan posting a quote which said: "I'm not his fan. I'm his wife." "Look at the money I spent because of you, husband," another posted, alongside a receipt that showed she had spent 148 yuan (£16 ;$22) on Centrum. This was clearly an ad made for a very particular market, experts say. For many of his Chinese fans, waking up to a suited Hiddleston is a fantasy come to life, so the point-of-view format is a clever trick. "Many female fans often consider their idol their imaginary boyfriend or husband," Professor Zhang Kuangjie of the Nanyang Technological University told the BBC. "This ad appeals exactly to those fans' fantasies. The fact that he speaks very good Chinese [in the ad] further adds to [his] likeability." Prof Zhang adds that the fact the video is vertical - a format made for mobile phone screens - could "make the fans feel like they are having a virtual chat with the celebrity", creating a more intimate experience. There's also the novelty of being served breakfast by a Western man, says Tay Guan Hin, founder of ad agency the TGH Collective. "For a Chinese woman to be served by a man is not common in Asia, let alone a Caucasian man, so that's something that adds to that [fantasy] element," he said. A spokeswoman for Pfizer, which own Centrum, would not name the ad agency in China that made the film, but told the BBC it was made to "maximise Centrum's international appeal amongst the digital-savvy generation in China". So there is a more practical reason for the vertical format than just intimacy. "In a mobile-savvy country like China where there are close to 900 million mobile internet subscribers, having the ad executed in a mobile-first channel makes perfect sense," Rezwana Manjur, Editor of Marketing Magazine, told the BBC. "The medium [sometimes takes] a back-seat or becomes an after-thought. Centrum in this aspect, puts the consumer's content consumption [habits] at the forefront." And though some Western viewers have called Hiddleston a sell-out, Charlotte McEleny, Asia-Pacific publisher at marketing news platform The Drum, says using celebrities in adverts is "basically a necessity in China". "Hiddleston has become a big name in China due to his Marvel association... he's a great choice," said Ms McEleny. The ad has of course been spotted outside of China though, and ironically drew criticism for the exact same reasons it gained praise in its intended market. "Because this vertical format forces you to be in the point of view of that woman, it feels a lot more intimate and immersive. So for some Western audiences, it might feel like it's a bit voyeuristic," said Mr Tay. And for some people, it was a little too close for comfort. "Forming a support group for the victims of Tom Hiddleston's Centrum commercial," said one user on Twitter. "The ad is utterly terrifying. Watch it if only to feel like you've woken up in your own home invasion nightmare," said another. But Charlotte McEleny from The Drum said the ad could teach brands a thing or two about China. "Rather than calling this out for being weird or creepy, Western businesses should probably be taking notes on how to build stories into new formats."